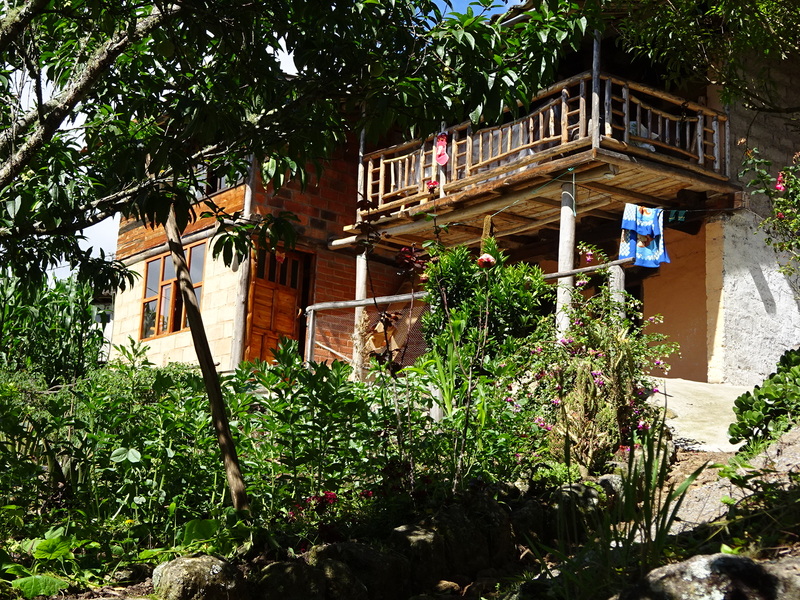 Homestay with an indigenous family in Namarín! 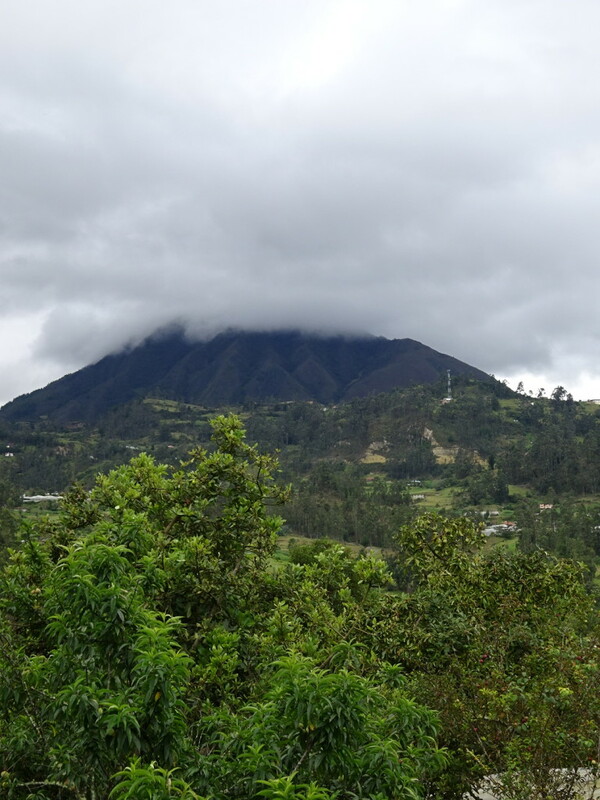 Posted on February 3, 2015 by No Map Required Posted in Ecuador, Places	. Man, oh man! After almost 7 weeks in Cuenca, it was time to take our leave and I admit we were a bit nervous about heading out again. Just so long in one place, we needed to get into the groove of being on the move again. Luckily Aaron’s dogged research skills found us some incredible opportunites in the small town of Saraguro and the surrounding villages about 4 hours south. 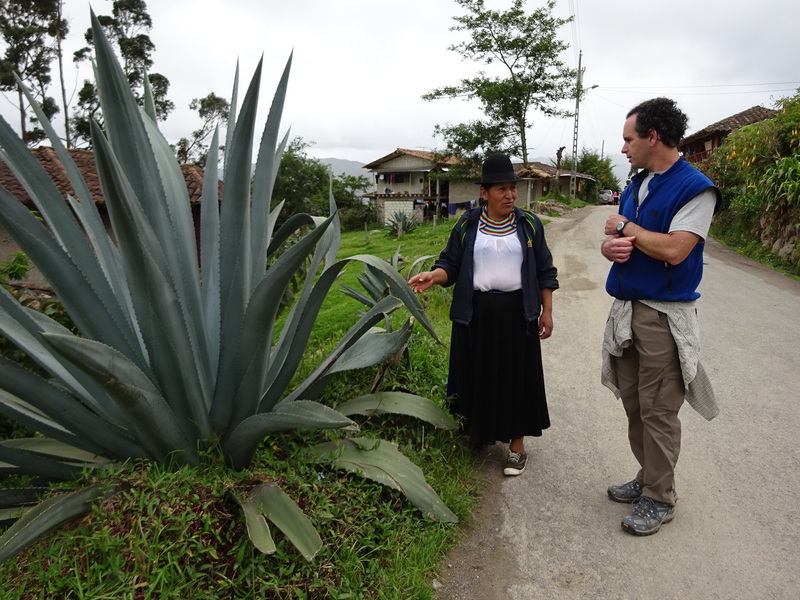 After leaving Cuenca by bus, we arrived in Saraguro – high in the Andes (read: chilly!) near the southern border of Ecuador. We made our way to a little tourist office (seriously, just a guy and an office) to meet with Lauro – a man Aaron had managed to make email contact with the day before. Lauro, the organizer at Saraurko, said, “Just come and we’ll figure it out once you’re here.” (all in Spanish…so once again, I thank Aaron’s H.S. spanish teacher for making this trip possible). In addition to arranging three artisan visits (Aaron will blog about those), we got to do an overnight homestay with some indigenous farmers in the neighboring village of Namarín. We spent about a day and a half with Maria, Marcelo and their children; an experience neither of us will soon forget and, so far, one of the biggest highlights of the trip! 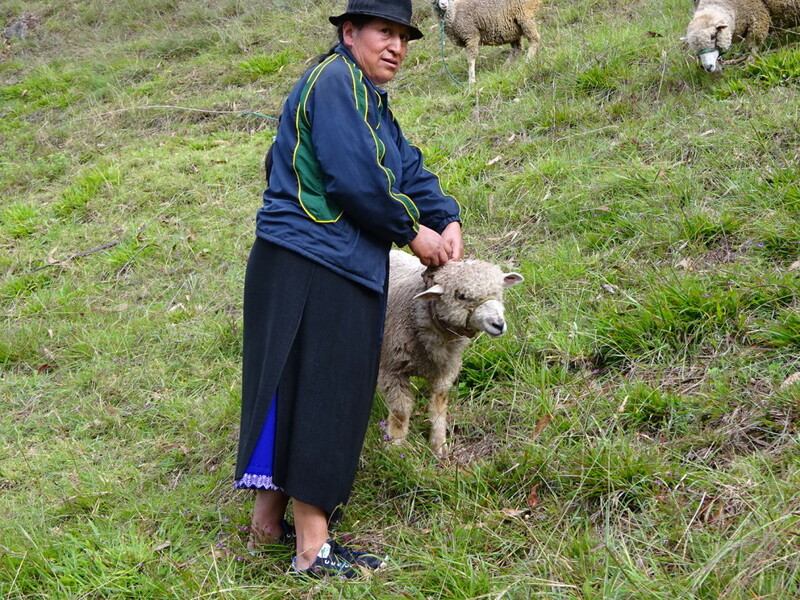 Lauro was an excellent ambassador for Saraguro and the local indigenous peoples. Not only did he make all the arrangements, he also personally drove us to every stop and “paved the way” for us! 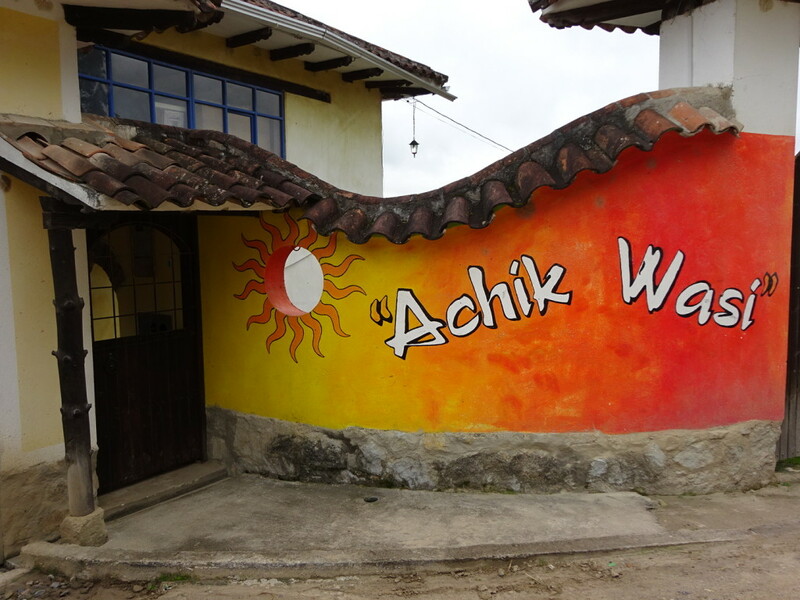 We stayed in a hostel run by Saraurko the first night (Hostal Achik Wasi – “wasi” is the indigenous Quechua people’s word for “casa” or house). 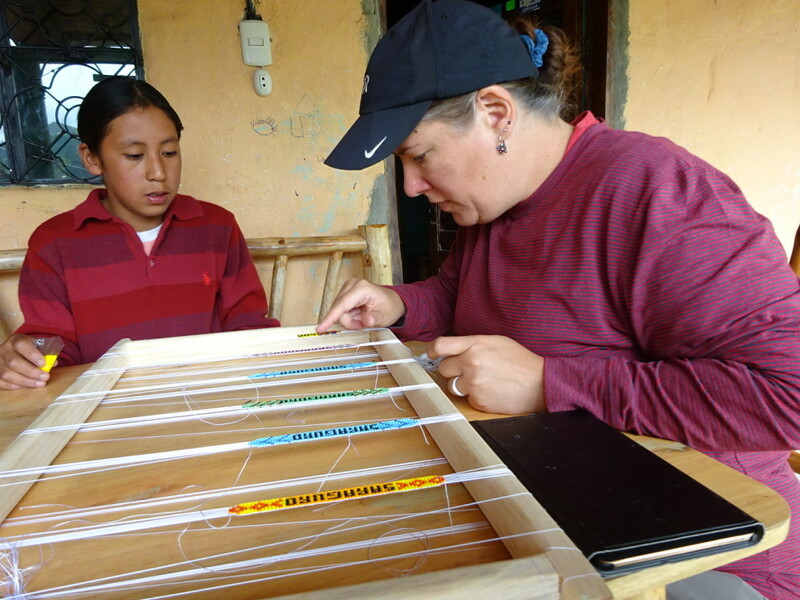 Saraurko is part of the Fundacion Kawsay, an organization working to promote tourism with the local indigenous tribes to help them retain their cultures by showing them to tourists and visitors. 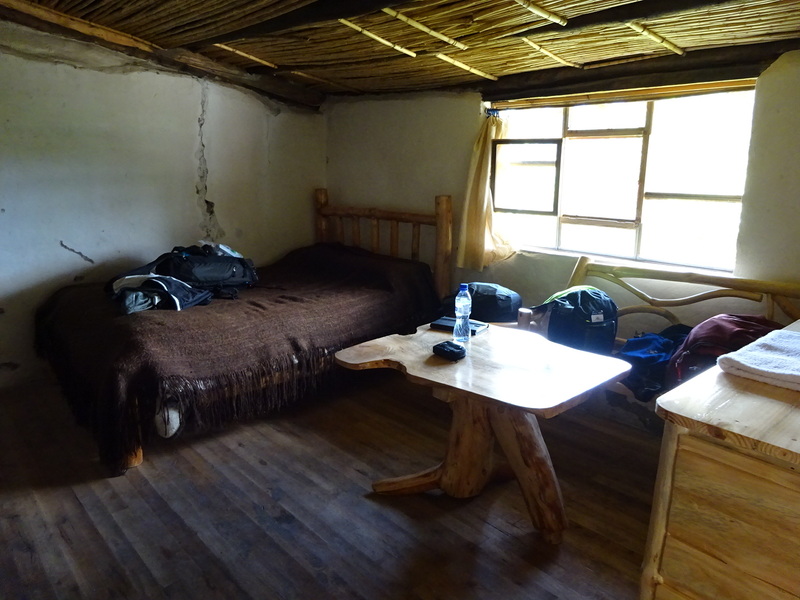 Our first night hostal in Saraguro – beautiful, but co-o-old! This was our homestay house in Namarin. This is the door to our room. It is just to the side of the main house — connected, but you can’t get to it except by going outside and through this door. Our room! 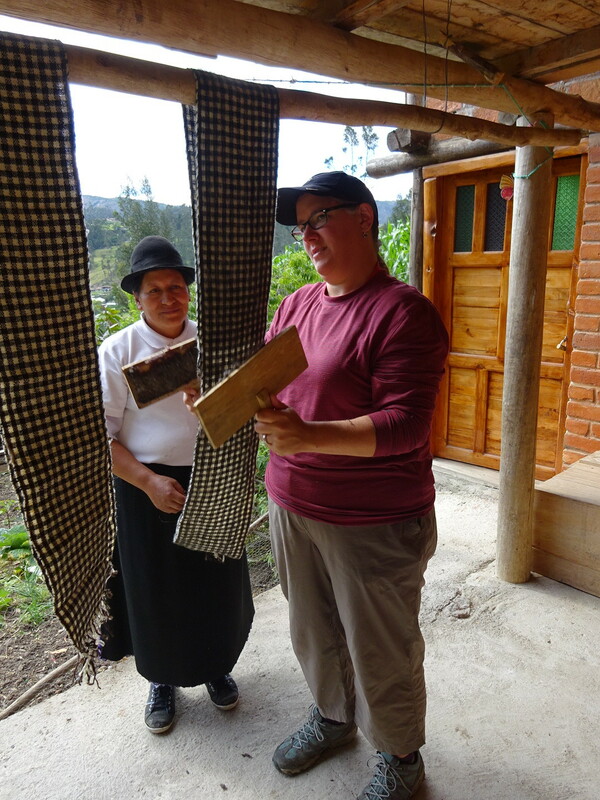 All the furniture was made by Marcelo who is a rustic carpenter by trade, along with farming on their property. There’s also a chimnea, bunkbeds and a bathroom. About the cold – it was between 50-60 degrees most of the time. Our hostel was darn chilly and no heat…you just load up on blankets and cuddle. We were in Saraguro and Namarín for three days and two nights and by the end we were wearing every piece of clothing we brought! The night of our homestay we were quite chilly and asked about doing a fire in the chimnea. It definitely took the edge off, but it also filled our room with smoke! The perils of lighting wet wood… so we had to open the door. I think it was a net gain of heat, but it was a little tricky. The view from the front of the house. It changed all day as the clouds came and went and the sun peaked out. At night we went out and looked up a the bright stars – nothing like having no street lights to make the sky shine. One of the gardens around the house. This had lettuce, cabbage, some root veggies and herbs. There was also a corn/bean field and tomatoes and some other veggies in another field. 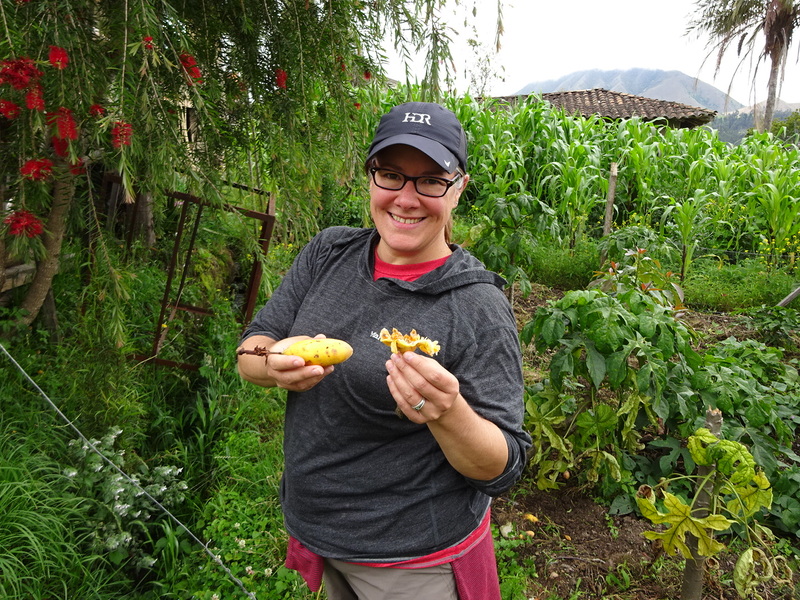 Interesting: Every yard has a corn/maize field…and every field also grows a legume alongside the corn – sometimes growing up the stalks like ivy or kudzu! It must work because that’s how they all do it! 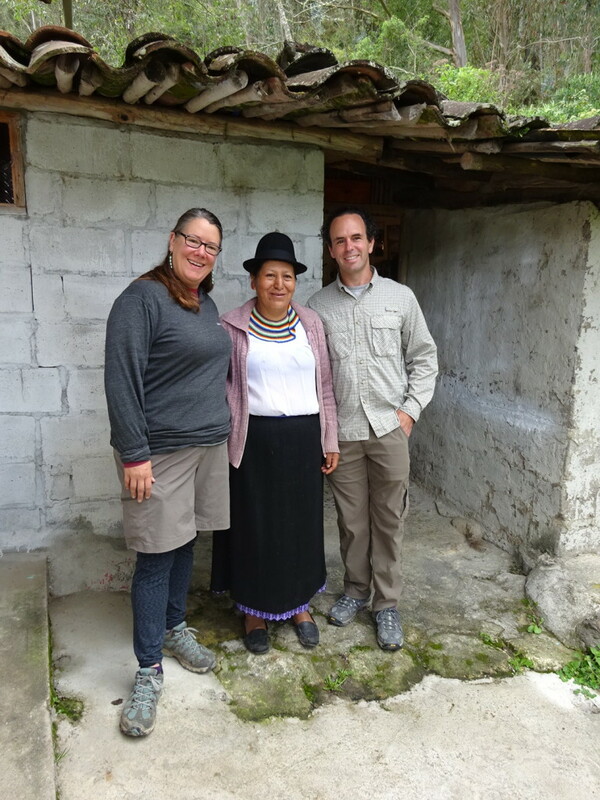 Aaron told our homestay mom, Maria, that where I grew up there are “mucho, mucho grande” corn fields. Not missing a beat, Maria asks “chemical or natural (chemico o organico)?” We explain that most are probably grown with modern fertilizer/chemicals, etc. but there are some that are organic. 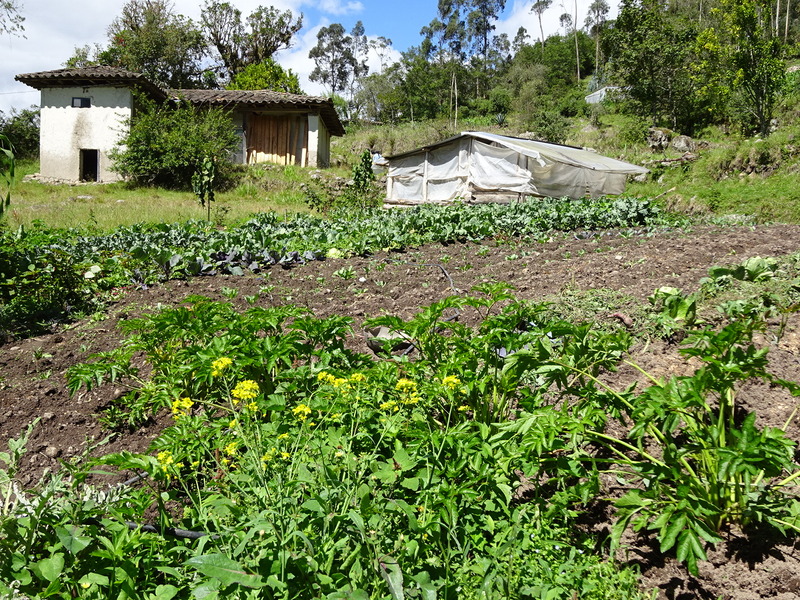 This is a theme we’ve noticed throughout Ecuador where people pride themselves on natural and organic living. 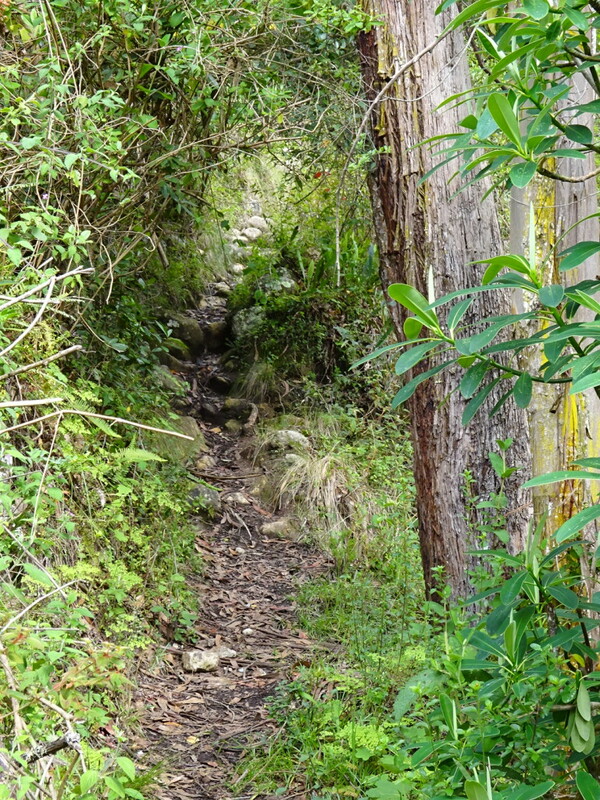 Everything – EVERYTHING – around Maria and Marcelo’s home was edible or medicinal. There were multiple trees, all with different fruits, along with multiple gardens and fields. All of it used to feed their family and a little extra that they can sell. 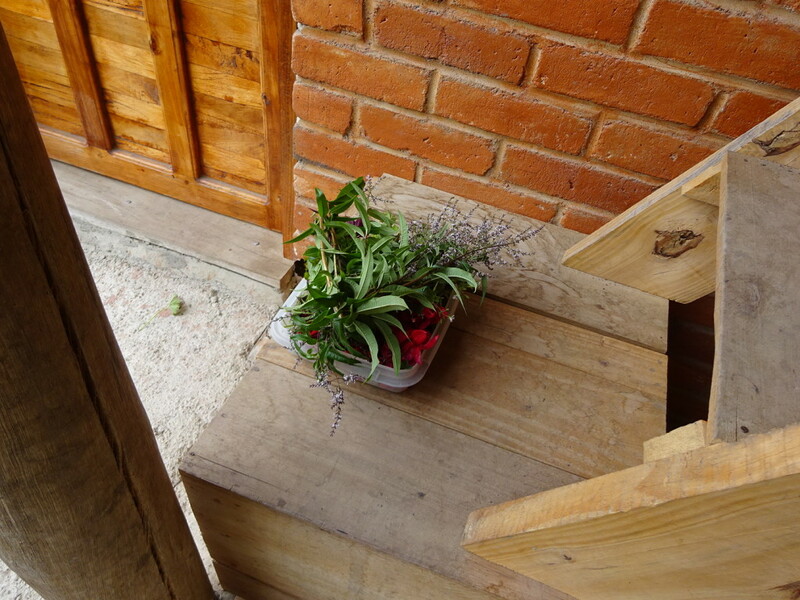 Fresh flowers and herbs from the garden for horchata! Horchata in Ecuador is an herbal tea kind of drink that is very popular here (not the rice-based version common in Mexico). We were first introduced to it in Cuenca (a version made and blessed by nuns) and neither of us liked it at all. When Maria asked Aaron if we like horchata, he said “it’s not our favorite”…but after Maria made it we are both SOLD! 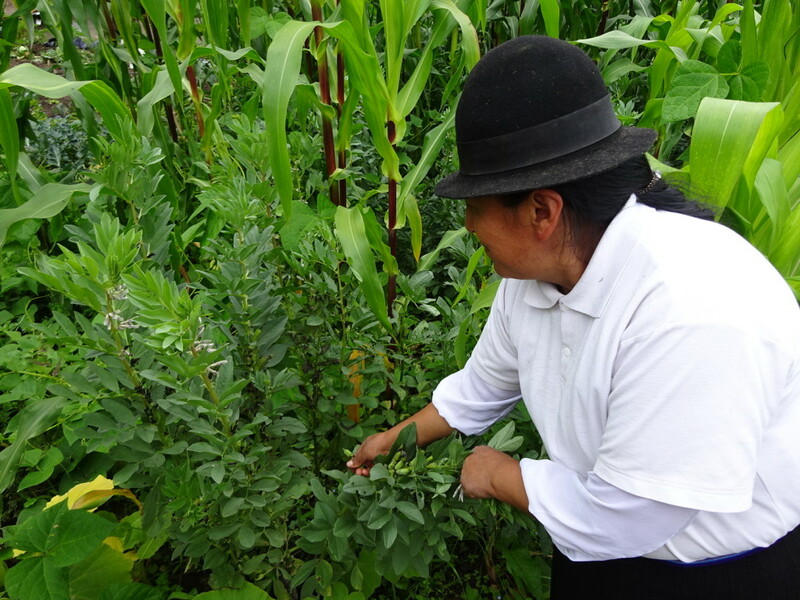 Maria used their herbs, fruits and flowers fresh from the garden and cooked them up into a warm, pink, sugary drink. We both LOVED it! Lunch is served! I loved, loved, LOVED the charred corn. It was a lot like the old maids from popcorn, but crunchier. Every meal had soup and was (I think) vegetarian — probably because veggies are in the yard and don’t need to be purchased, but that’s just my guess. We always ate with these little wood spoons. I was worried about Aaron, but he loved the food and aside from the lettuce salad he ate everything. Breakfast was barley, a potato and salad with a sauce on it. Gotta say, that filled us up and we were ready to go after that! Nothing about the homestay is structured, so it’s what you make of it and whatever the family happens to be doing that day. We tried to take our hand at a few of the chores and such around the house. I took my turn combing newly woven scarves to help soften them (it really did make a BIG difference). This was deceptively difficult…I had to take a few breaks to rest. The scarves are made with wool from their six sheep! Maria sells veggies from the garden (people just know to stop by to make a purchase), these scarves and beaded jewelry. After seeing how involved beading is, I have a new found appreciation for it. I couldn’t help but buy some jewelery….I mean, it’s me after all! 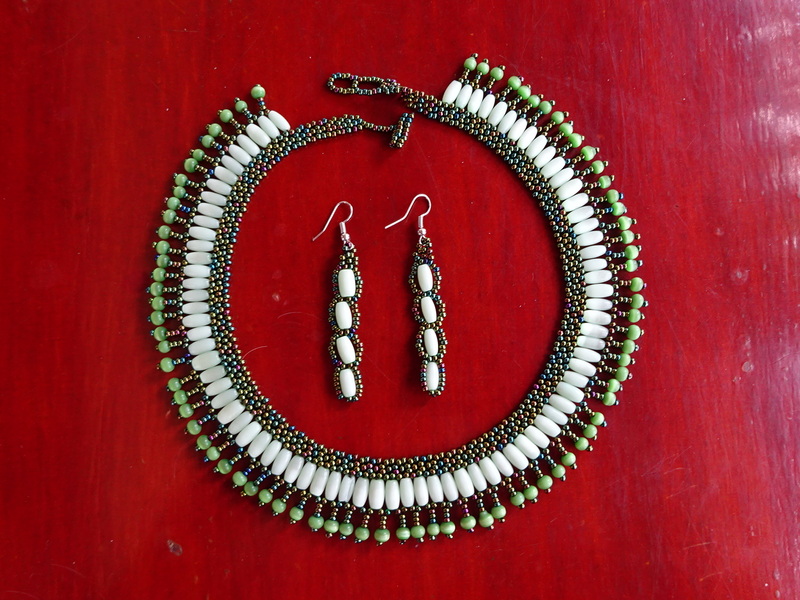 My new necklace and earrings! Samuel teaching me how to bead. Yet another thing that is harder than it looks. You can see our tablet is out…that is because we have a translation app on it and occasionally we would type a word in so we could continue with our lessons. 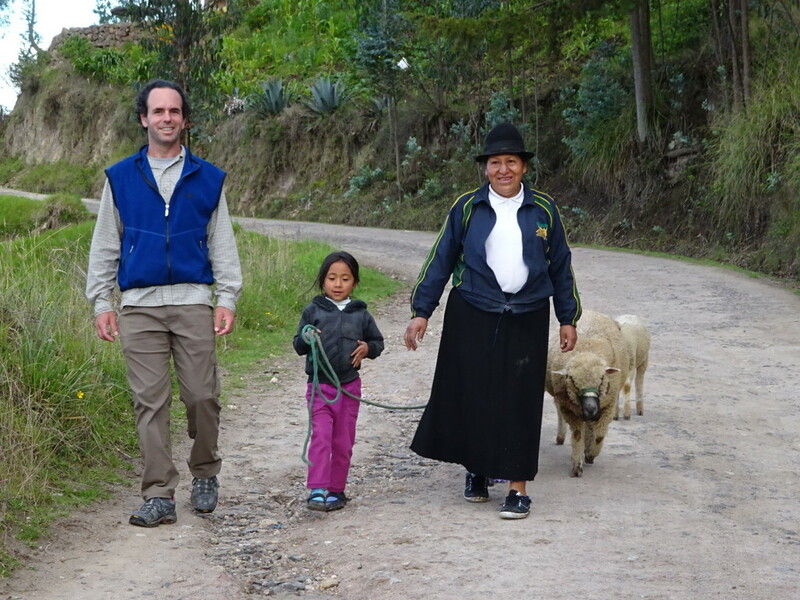 We learned that every morning Maria walks their flock of sheep up a big (steep) hill so they can graze. At night she usually sends one of the kids to fetch them back down. On this visit, we had arrived in the afternoon so she took me and Aaron to get them. It wasn’t too hard of a hike, but you all know I’m not in great hiking shape…Maria’s 5 1/2 year-old daughter Genesis ran circles around me in her dress shoes. Me and my fancy hiking shoes? Yes, I fell. It’s not a hike until I slide down a hill. That said, it was a beautiful hike! We loved it and joined Maria in the morning to take them back. At night the sheep sleep under a tarp behind the house. This is 5 1/2 y.o. Genesis (the “g” is pronounced like an “h”). She beat met to the top of the hill. A quick word about the kids: Marica and Marcelo have four kids ranging from 5 1/2 to 17, plus another boy who stays with them. The three girls are in school, but the boy doesn’t go – he just doesn’t like it apparently. The oldest girl, Gabriela, is about to graduate and is hoping to go to college to study business. The mid-kids, Gladys and Samuel, didn’t say a whole lot while Genesis, the littlest, was super shy but very sweet. She stuck close to her dad. After school that first afternoon she was finishing her homework (tracing shapes) and I enticed her into a game of peak-a-boo which was a big success. After that she wasn’t shy at all! Then I broke out my colored pencils and we drew pictures together until it was time to get the sheep. She decided to go with us! We noticed that the kids didn’t fight or squabble…they rarely called for their parents, they just seemed to go about their business doing school work, house work, chores and hanging out laughing and talking together. Gotta say – we liked that a lot. 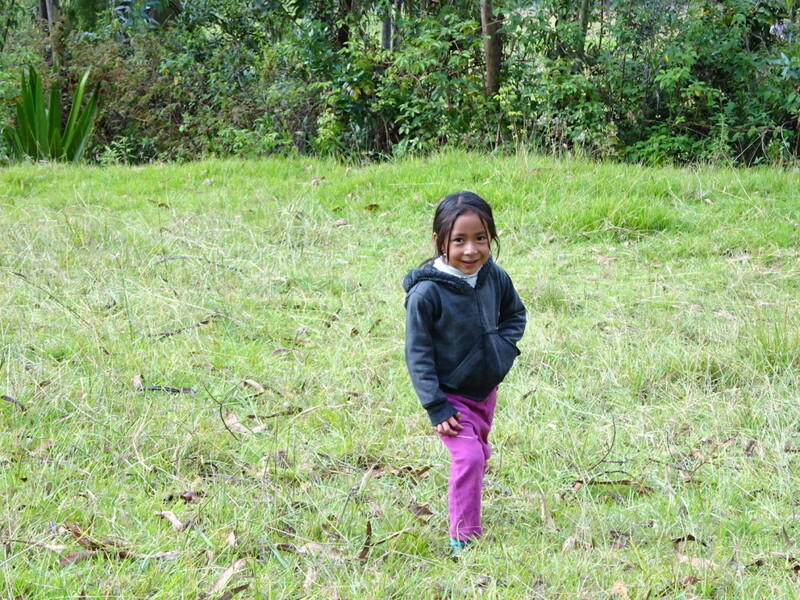 In fact, we’ve encountered very few whiny/crying kids in Ecuador. The sheep on the top of the hill. This picture doesn’t do it justice. It was actually more than a little challenging standing upright here. We chatted with Maria and it was just lovely. Taking the sheep home for the night. Genesis must have gone straight to bed after this…we were out for a couple of hours, I think, and it was a lot of walking and hiking. Still, she absolutely insisted she get to lead the sheep home! On a post-sheep walk through the village, Maria took time to tell us about all sorts of plants, natural remedies and community life. We asked if there is crime and she said there is some…but it’s handled through “community justice” which could result in cleaning the public toilets. At night. With freezing cold water. Ew! Maria introduced us to yet another fruit (“taxis” I think) where you crack it open and eat the seeds like a granadillo….and, again, it was delicious! This here is Pinto. He will likely re-appear on our Dogs of South America Post. 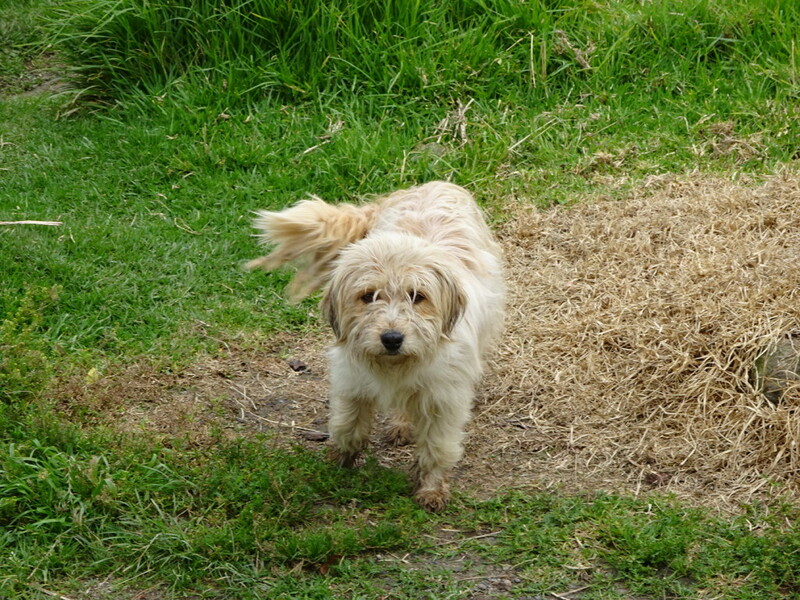 He followed us around the whole morning…sweet puppy. Recess! 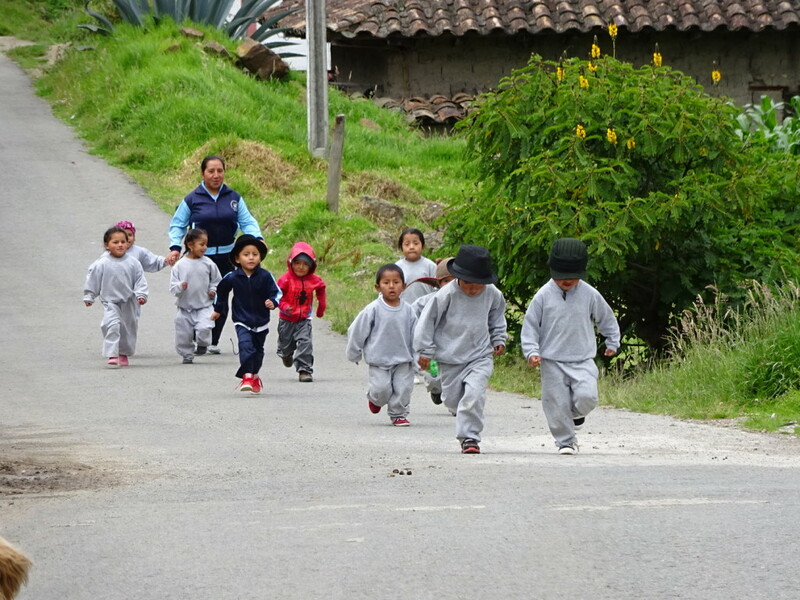 These little kiddos were out for a run with their teacher. Love the hats and the spiderman jacket — old and new together. We had seen a few of the kids earlier on their way to school. They were in the back of a pick-up truck that served as the school bus. Seeing all those cute little kids waving to us from the back of the pick-up was awesome! When we were doing our village walk with Maria after dropping off the sheep in the morning, we stumbled upon another film crew and they immediately incorporated us into the scene. I think we must have been the only gringos in the area, but we were more than happy to try the local beverage (a pre-tequila drink called “chich” made from agave plants) and say “queso” for the camera. Anything we can do to help promote tourism for these wonderful folks, we’re glad to do! We are all smiles here, but saying goodbye to Maria and her family was kind of sad. She was so friendly and her hospitality was unmatched! We hope to visit her again someday! Let me just say, there wasn’t a waterfall in our room like on Anner’s birthday, so it was alllllll good! This is my favorite post so far. Those kids running in their little grey sweatsuits and the HATS. omg i just died. The kids here are so cute everywhere! Don’t you worry, we’re going to have more adorable photos coming in the next few posts. Great photos. Sounds like the trip so far is even better than you hoped. Annar, you don’t need to slip or fall just to make something a hill. (I’m a geologist. Take my word for it.). So, just stop that! This comment totally cracked us up! So right, Casey….sooooo right! Really enjoyed this blog and it sounds like you did too. This sounds like it will remain a highlight so continue to enjoy your wonderful experiences. We are thrilled that you are enjoying the blog. It gives us a chance to re-live all the good times! We head to Peru next week and we can’t wait to see what might be instore for us! What an experience and your comment about the kids not whining and having to be told what to do is very impressive ! I’m jealous of them, hard work I’m sure but they seem very happy. The kids did seem to be happy…and pretty excited to have visitors! I love your blog…feel like I just spent the day with Maria and the family!!! Thank you for taking the time to post and blog!! Thanks for following along. Blogging gives us the chance to keep re-living all the good times. I hope we get another homestay or something like it as we continue our trip. Your blogs just get more and more interesting. How neat that you’re getting so deep into the country. Walk, hike, bus, enjoy on. Thanks, pa/papa barr! 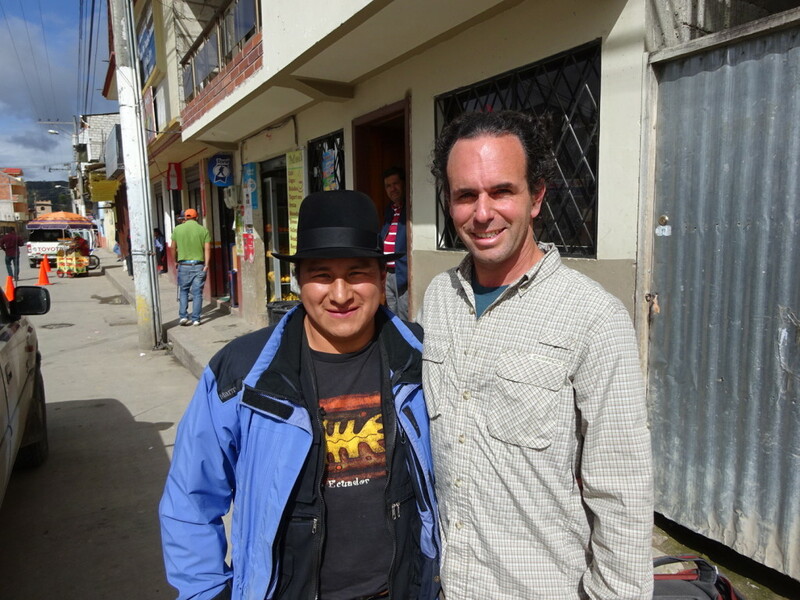 Got three or so more Ecuador blogs in the pipeline and we head to Peru early next week. Can’t wait to see what we turn up! 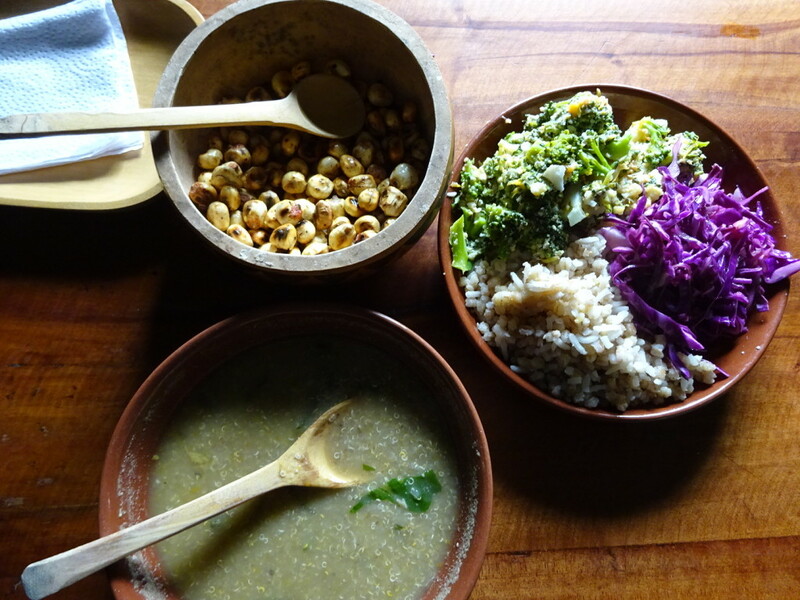 I loved reading about your homestay, so glad you are getting off the beaten track! And I always knew you and Aaron were stars. Who knows, maybe next year you’ll be in a National Geographic film! You never know! Perhaps the 3 of us can co-co-host the film? So neat you stayed with that family. So different from everything in the US, I take it they are not popping a pill for every new disease you hear about on TV and eating processed foods daily. So excited for you both and your experiences. Thanks for sharing! Nope, no pills there – everything was home remedies straight from the garden! In fact, with a quick peak in their kitchen, we didn’t see a single processed/packaged food! All natural from farms around town and their own gardens. Really loved the post. 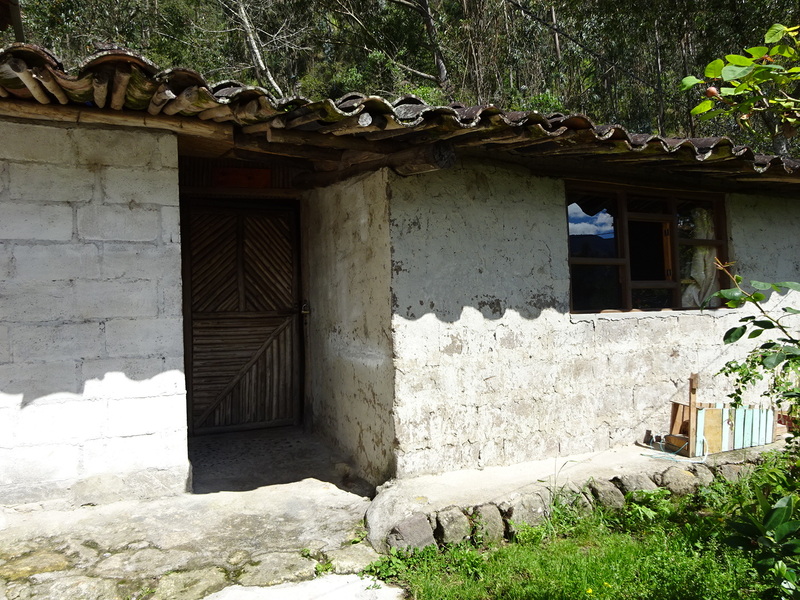 I’m heading to Cuenca this weekend and am considering the homestay in Saraguro. Can you please send me contact information for the folks that helped you set this up? Also, is it worth rearranging my schedule to be in Saraguro on a Sunday for the market? Hi Phil – you’ll love Cuenca! Amazing city and our 6 weeks there were wonderful. We definitely recommend the Saraguro visit and homestay. We set things up with Lauro at Saraurko, the tourism organization for Saraguro – http://www.turismosaraguro.com/. His email was gerencia@turismosaraguro.com, but there’s a new one on the website now, so perhaps try them both? It really was worth it! Afraid we didn’t go to Saraguro’s market, so I can’t advise there. If you set up times to meet with some of the local artists, which Saraurko also does, perhaps that would be enough? We met 2 one day and 1 another.